The original chocolate truffle was first invented in France and named after the black truffle fungus that grows in the forests there. Traditionally, truffles are made with a ganache­­­—a chocolate and cream filling, which was thought to have a striking resemblance to the black truffle fungus. The ganache is then coated in cocoa powder to represent the dirt the ground truffles are covered in. Chocolate truffles have been associated with indulgence, similar to the black truffles of France, which were retailing for $30 per ounce from the 2010 truffle season. Truffles are the perfect bite-sized treat to enhance any dessert table, and with the Thanksgiving holiday approaching, this is the perfect time to make these palate-pleasing sweets. These Pecan Pie and Pumpkin Pie truffles are simple and delicious, and can also be adapted to special dietary restrictions and selective tastes. Using different types of chocolate and coatings can also offer great variety! 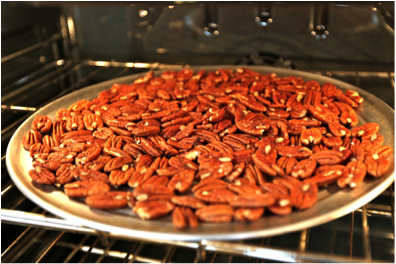 Toast pecans on a baking sheet at 350°F for 5 to 10 minutes, but be careful as they can scorch easily. Then finely chop the pecans. Stir together pecans, graham cracker crumbs, brown sugar, and salt until combined. Add honey, water, and vanilla, and continue stirring. Finally, use your hands to fully incorporate all the ingredients together. 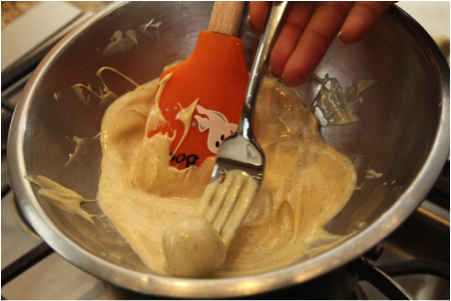 Using a small spoon, form the mixture into one-inch balls. If you have a kitchen scale, 10g balls are the perfect size. Freeze for 2 hours on a parchment-lined baking sheet. When truffles are hardened, fill a pot with one inch of water and bring to a simmer. Set a metal or glass bowl over the simmering water and be sure that the bowl is not touching the water because the hot water will cause the chocolate to burn. Pour half the chocolate in the bowl and allow to melt, stirring constantly. Turn heat off and add the remaining chocolate. Continue stirring until melted. Dip the truffles into the melted chocolate and stir to coat. Remove with a fork, allowing excess chocolate to drip for a couple seconds, and place on parchment paper or in a mini cupcake liner (this makes for great presentation when taking to a party). Allow truffles to sit for about 15 minutes until firm or place in refrigerator to harden. 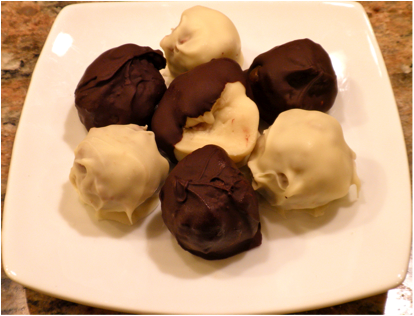 Store truffles in the refrigerator for up to two weeks. Stir together graham cracker crumbs and pumpkin pie filling. Use your hands to thoroughly mix ingredients. 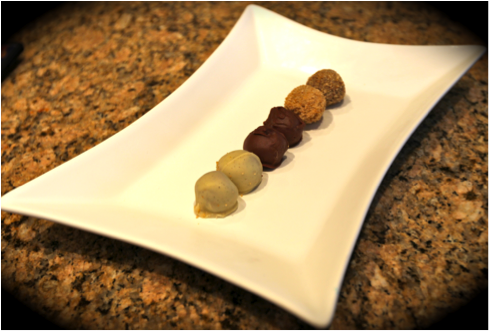 Using a spoon or measuring 10g chunks on a kitchen scale, form one-inch balls. On a parchment lined baking sheet, freeze truffles for 2 hours, or until hardened. Fill a pot with one inch of water and bring to a simmer. Place a metal or glass bowl over the simmering water, making sure the bowl does not touch the water. If the water touches the bottom of the bowl, the chocolate can burn. Add half the chocolate chips to the bowl, stirring constantly as they melt. Then add the remaining chips, continuing to stir until all the chocolate has melted. Into a separate shallow bowl, pour the maple sugar. Roll the truffles in the melted chocolate until covered and remove with a fork, allowing excess chocolate to drip for a couple seconds. Place on parchment paper and allow chocolate to set for a couple of minutes before rolling in the maple sugar. Roll until truffle is completely covered in the sugar. Place back on parchment paper—or in a mini cupcake liner—for 15 minutes until hardened, or place in the refrigerator. Store in the refrigerator for up to two weeks. Alisha is in her second year at the Friedman School as a dual Nutrition Communications/DPD student and is excited to soon become a Double Jumbo. She is a true California girl, enjoys traveling, trying different types of fitness classes, and attempting to create healthier versions of recipes. Alisha records her recipes she finds blog-worthy at SavortheFlavour.